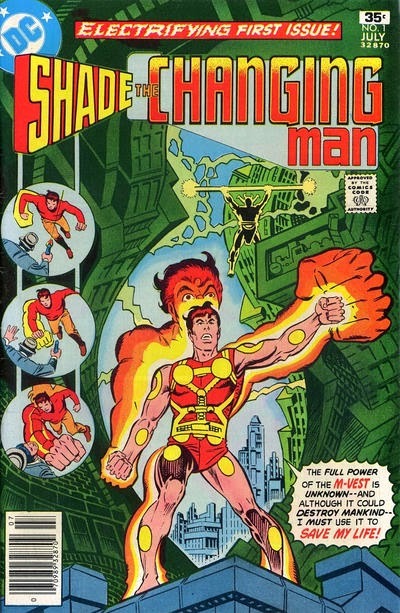 As I suggested yesterday, I'm going to dive headlong into the weird world of Steve Ditko. I've owned this run of Shade for some time now, and have never really had the inclination to read through it, maybe because I hold Peter Milligan's reinterpretation in such high esteem. I had once thought of doing a similar thing with Shade that I've done with Animal Man, in that I will buy up any (and I do mean any) appearance that the character makes any time in his history. Animal Man takes up two full short boxes by now (which could make a nice half-year's worth of Animal Man posts...hmmmm....), but, if I'm to be honest, a lot of Shade's other appearances (in 80s Suicide Squad, for example) are kinda, well, mediocre. We'll see if my week of reading his original adventures changes things. Yesterday I talked about the dynamism of Ditko's art in Amazing Fantasy #15, and it's definitely in full force in this initial issue of Shade. But, as I was reading, there was something different that I initially had trouble identifying. It could be, I suppose, that there's a 15-year gap between the two works, and that Ditko's art has changed and matured. That's definitely an aspect of it. But more than that, the panels in Shade, when compared to the Spider-Man origin story, are jam-packed with detail. The backgrounds seem to have just as much detail and motion as the characters in the foreground. It took a bit of adjustment to read this way. Even with something like Dave Sim's Cerebus, where Gerhard's backgrounds are incredibly detailed, the characters take precedence over their setting. In Shade, the separation is not quite so explicit. As I'm reading through, this is something I want to keep in mind. Is it something to do with the story itself? We get very little idea of the relationship between Meta and Earth in this first issue, but does the dynamism of the backgrounds say something about the fictional relationship between these beings from Meta and their physical relationship to the environments with which they interact on Earth? As for Shade himself, I'm intrigued by him. Milligan's Shade is a proto-Emo slacker (which is probably why I loved that run so much), but this Shade is a wrongly (according to him, anyway) convicted traitor to his state, on the run from the woman whose parents he crippled. Again, never having read this series, I was unaware of the parallels with Kathy George's family in Milligan's run, so that lineage is nice to see. One other thing I'll say before this becomes a lengthy (-ier) essay is that Ditko's design work in this book on the Metans is amazing. Shade's "M-Vest" is a super-cool costume, and all of the Metan fashion is weird and wonderful to look at. Both the design and the colour of the costumes are lovely. The final panel of this issue has a brief peek at the villain that will, I assume, show up next issue, and it's creepy and weird, and has me wanting to jump ahead. Which actually brings me to a problem I had foreseen, but still haven't figured out how to handle: what if I want to take a whole run and just read it? Do I count them as my daily comic for the week? Let's be honest. At this point, I don't have time to read much more than one comic a day. I'll wait to deal with this problem until I'm living in that perfect world of mine. Tomorrow I'll try to say a bit about the dialoguer of the series, Michael Fleisher, whose comics encyclopedia work I've found really interesting.